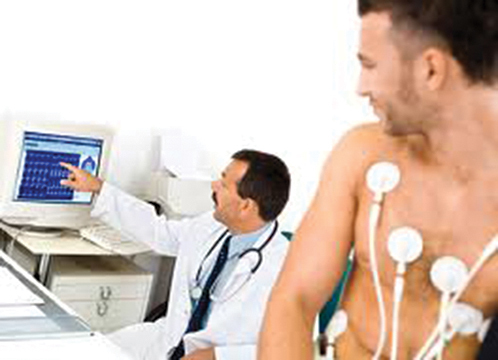 Electrocardiography (ECG or EKG) is the process of recording the electrical activity of the heart over a period of time using electrodes placed on a patient’s body. These electrodes detect the tiny electrical changes on the skin that arise from the heart muscle depolarizing during each heartbeat. In a conventional 12 lead ECG, ten electrodes are placed on the patient’s limbs and on the surface of the chest. The overall magnitude of the heart’s electrical potential is then measured from twelve different angles (“leads”) and is recorded over a period of time (usually 10 seconds). In this way, the overall magnitude and direction of the heart’s electrical depolarization is captured at each moment throughout the cardiac cycle.